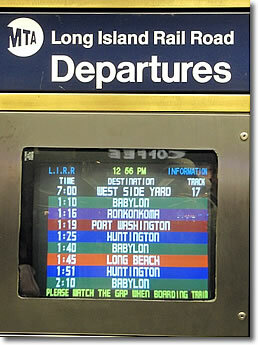 Use the LIRR and AirTrain to travel quickly between Manhattan and John F Kennedy International Airport. New York City's Metropolitan Transportation Authority (MTA) operates the Long Island Rail Road, connecting Manhattan's Penn Station with the cities and towns of Long Island to the east of New York (map). You can take the LIRR from Penn Station to the Jamaica station to connect with the AirTrain JFK to John F Kennedy International Airport. The train ride from Penn Station to Jamaica takes about 20 minutes. AirTrain JFK trains depart Jamaica for the airport and all nine airport terminals every two to 12 minutes, depending on the time of day. In principle, you can travel from Penn Station in Manhattan to your terminal at JFK Airport in 35 to 50 minutes, but of course it's best to allow a bit more time in case of delays. Brooklyn Bridge, and behind it the Manhattan Bridge, East River, New York NY.